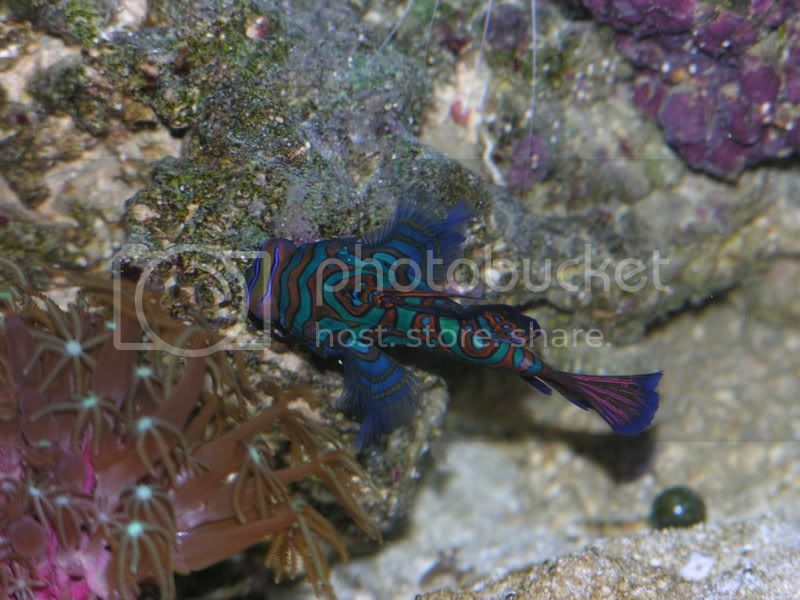 My new Mandarin Dragonet!!! | Saltwaterfish.com Forums for Fish Lovers! What do you guys think? He's been in my tank for 2 weeks but he's been in the original tank for over a year. My friend is a manager at a lfs and when I told him that I needed something to control my pods population he pulled this little guy from the "store display" tank, the one where it says not for sale. He said he wanted to give me a goby that was for sure healthy and eats frozen food. Unfortunately, since I put him in my tank he hasn't been accepting frozen food. Now my friend told me that maybe he's been feeding off of pods and might not eat frozen foods again till he gets hungry. He told me that in-case my goby looks like it's not going to survive, then just bring it back to him so he can put it back in his tank display. Now my question is, when he picks on something off the rock, does that mean he's eating? Or he's just picking on something that looks like a pod but not really. Also every few minutes or so, it looks like he releases a smoke look a-like that comes out of his gills. What does that mean? BTW: I bought a HOB fuge with chaeto algae just for him and just dumped a bottle of Tigger-Pods in it today hoping the pods will breed so he can have enough food in the long run. I only have a 20 gallon tank but has 50 lbs of live rock. im not sure what it means but when they get stressed or nervous they release this slime liek the smomke gel you saw. it would be the same hting but mine did tht as well. i would have to say tht they are an amazing fish! mine was extremely hard to take pics of cus he was always in the back of the tank between the rock and glass. I know, they do look amazing. My favorite fish overall. At first I thought the smoke thing looks awesome, because I thought he uses that too intimidate pods or something I dont' know lol. Does he look skinny to you? I thought he was at first but after searching for mandarin pics he looks normal to me. How big is your tank by the way? he looks fine but make sure he keeps on those pods. if he dosent then you know then end of the story! i have this empty real oyster shell in my tank and he loves to sit in there and look out at the room the tank was in. then he would go from the shell to the sand and flutter his fins.. ( i love tht) then he would skimm the sand, it is soo cool to wath this guy! Mine's on a 20 gallon with a HOB fuge. How do you keep your pods population on check? Does yours eat prepared food? Well some people say 100 lbs of LR is a must for mandrins. I think less is ok if you have a sump to reproduce pods, but they eat alot of pods, and can run out if you don't have a fuge to breed them in. I had a mandrin in a 75 gal with 85 lbs of LR and it died after 6 months cause i didn't have a fuge for pods to reproduce, those blottled pods don't last them long at all. And he refused frozen or live brine. So i guess my answer is you should have a fuge to keep a mandrin unless you can get it to eat other foods, that usually doesn't happen though. It's not like he sold it to me and that's it. He said take it back if it doesn't do well in my tank. I went to a nano reef forum to see how many people had success on keeping a mandarin in a small tank and I saw plenty. I actually found one that had 3 nano tanks and each one of them has a mandarin, although all three tanks also had some kind of refugium. So I guess we'll see what happens. Again he told me to make sure that I bring it back if it's not working out, because like what I said he's had this fish for more than a year and it's been one of his customers favorite fish to look at when they come in to his store. Also I thought the volume of the aquarium doesn't matter as long as you have a lot of rocks. yes a 75 and a 20 gal are huge differences a 75 gal is just about 6 feet long and a 20 tall.. well maybe more then 2 feet wide. you just have more rock and less space for a fish to swim around versus a 75 where it would equal out with all tht surface area. Obviously it is a bigger tank, but for my understanding, I thought mandarins doesn't need a lot of space to swim. I thought they just need a lot of rocks for pods. BTW: My friend didn't tell me this, this is from the research I've done. I don't want people to think that I only listen to my friend and other lfs. Well like you said, all the nanos have fuges, thats the key to breeding pods, a place for them to reproduce. That was an odd angle he looks really thin there, hes about like yours, except hes a male.notice the spine.